Peri and I were meeting Dave S at 9am, so when 10am arrived before Dave we weren't that surprised! Peri was on a gear mission and we followed shopping with a huge breakfast in Outside cafe. We managed to drag ourselves away and arrive at Frogatt just in time for the Archers. It was hot and sunny as this week has been designated summer (in case you haven't been told). 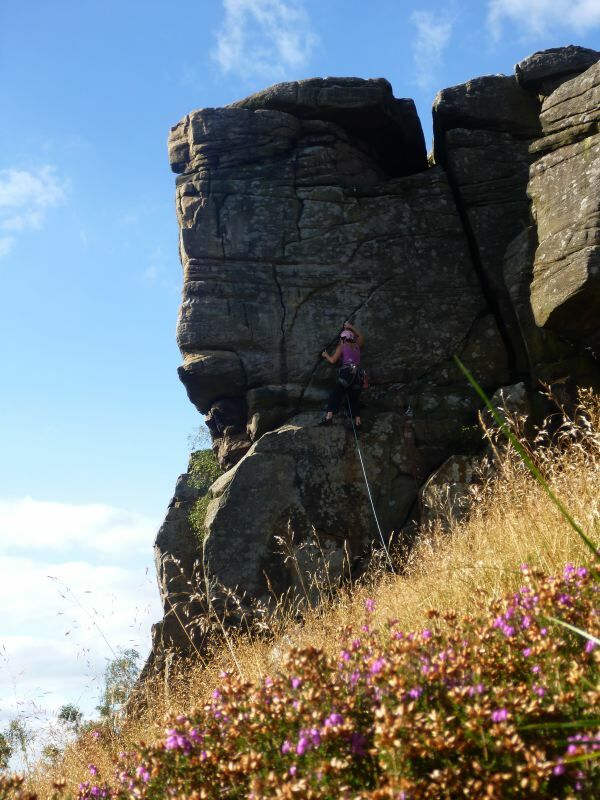 Peri had an appointment with Chequers Buttress (HVS 5a ***) but didn't want to jump on it straight away, so I did Diamond Crack (HS 4b **) a short but lovely little route by the pinnacle. Dave bloddered about jumping on the route (a regular theme) before we wandered down to the slabs where Peri ran up Heather Wall and I took my time, and placed some rubbish gear, on CMC slab (HVS 5a ***). I used a side runner at the top but Peri reckons a 0.5, narrow head, cam is good in the pocket. The crux move took me a while (including reversing it – hmmm) and the others strolled up (a slightly different sequence at the top) making it look peasy. We then went for the main event. All was looking good until a swift flight resulted in a few choice words and much frustration. Dave and I followed on ropes and we set up a top rope so Peri could sort this issue out. Suffice to say we were a while and all joined in the advice (heckling) ! 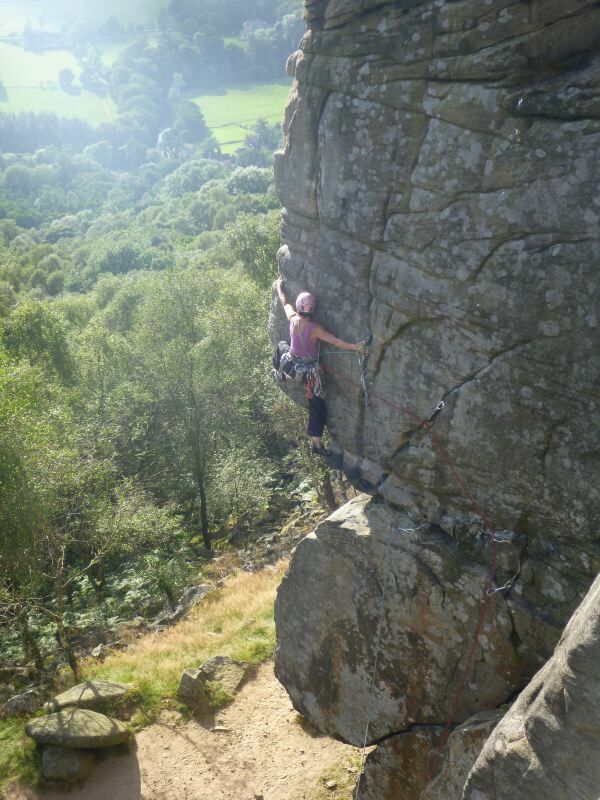 We also figured you can do the route just using number 6 rocks (anywhere between 4 and 6 of them) ! Midges came out and ended play – so a quick pint in the Grouse and we left – but Peri will be back and have her vengeance! Loads of Pix & Beta….. Eight members made it the August Bank Holiday meet in Braemar. The forecast improved as time went on and the weather was not as bad as expected – apart from Monday. Saturday morning saw some of the bikers up early tinkering with their bikes (Andrew) for what seemed like hours. Then Andrew and Peter drove for what seemed like (because it was) hours to dump a vehicle at Blair Atholl. Meanwhile Annie and Karen headed to the cafe – for a quick coffee and bite to eat. They needn't have rushed as the drivers/bikers did not return until 1pm. Then it was time for lunch of course. So after an early start at 2pm! they set off on their ride down Glen Tilt – again. Meanwhile the walkers Richard and Dave D went off to bag Carn Bhac – in the rain. Dave D had been keen to tag on another Munro but fortunately for Richard the clag removed interest in this option. Having done all the local Munros and with a big day planned for Sunday and dinner to finish cooking, Simon and I settled for a nearby Corbett (Sgor Mor) which could be done from the hut. We waited until it stopped raining before setting off – looking out for the bikers throughout our walk-in – little did we know they were still hours behind. 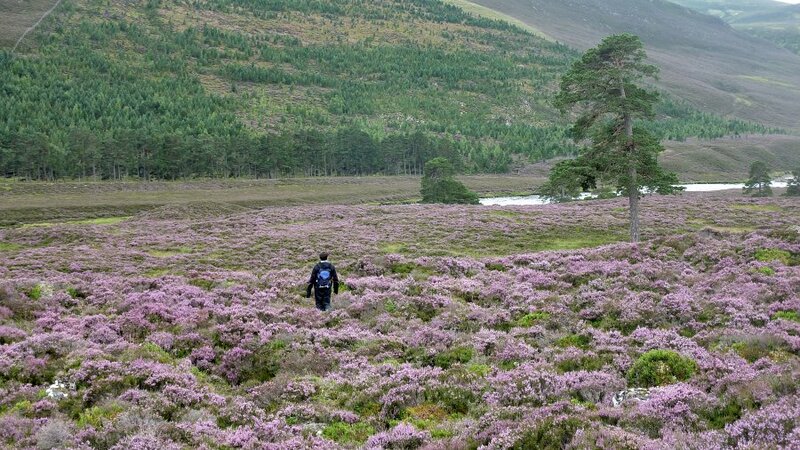 It was a pretty walk with all the heather in bloom – we never normally see Scotland at this time of year due to a certain small insect. The cloud was down on the surrounding hills, but we remained cloud-free throughout. The descent off the hill was slow progress as we trudged through heather, down past the bee hives and back to the forest and river. As soon as we stopped to remove waterproofs we were surrounded by midges which encouraged a quick retreat back to the hut arriving shortly before 4pm! Arriving just behind us was Karen who had been out for a local cycle. Around 8:30pm the bikers finally returned, slightly subdued, the ride having been harder work and less cyclable than they had remembered from last time. However, they soon perked up with curry and beer, followed by rhubarb crumble. Sunday had the best forecast and Simon and I had big plans – so we left the hut before anyone else was up. We cycled in to Glen Slugain – me moaning somewhat as the track was worse than I had imagined (didn't help that it was first time on a bike since last year). We then went on a long walk over Ben Avon and Beinn a'Bhuird, made somewhat longer by taking in all the tops (Simon is slowly turning into Charles). It was a good day for it though with cloud-free tops and mainly blue skies. Cold wind throughout – which would have made standing around climbing unpleasant, so a good decision to go for the walking option. 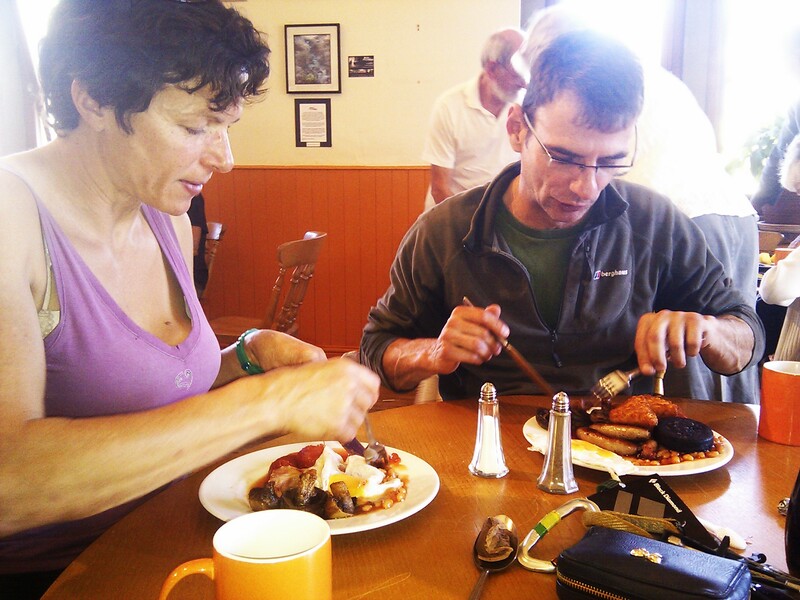 The rest of the club headed for Derry lodge where they split– Andrew, Karen and Richard R went up Derry Cairngorm. 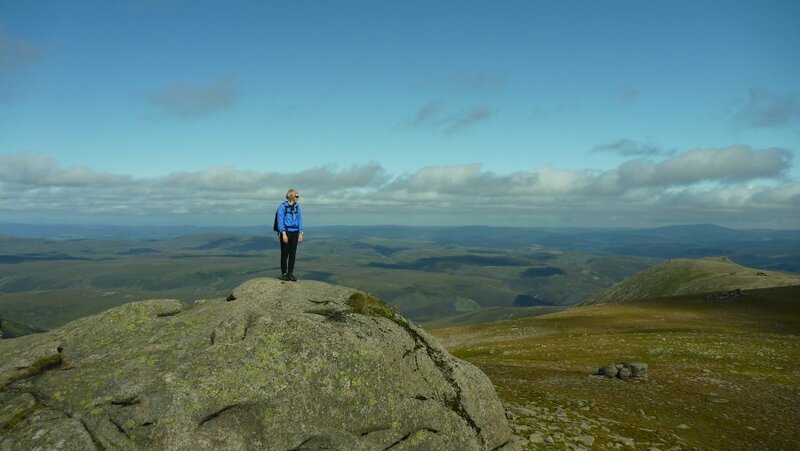 Meanwhile, Annie, Pete and Dave D went up Beinn Mheadhoin, followed by Derry Cairngorm. Both groups had a mix of people on foot and bikes and so there was a bit of a wait at the cars afterwards. Unsurprisingly Simon and I were back to the hut last – but at a reasonable time 8pm. 11hrs 15 mins for our cycle/walk. Midges were only an issue when we collected the bikes. It is amazing how it can go from no midges to being absolutely covered in midges in the space of 2 seconds! Thanks go to Dave D for shopping for the communal meal which Karen cooked whilst Dave D opted for a longer walk – so many thanks to Karen as well. Annie had remembered it was my birthday – so dessert was replaced with a large chocolate cake – many thanks to all. Monday – rain, rain, rain. A good day for most to be heading home. A blistered toe and wet weather saw Dave D and Richard heading straight home, as did Pete. Andrew & Karen were heading up north to stay in a lighthouse. 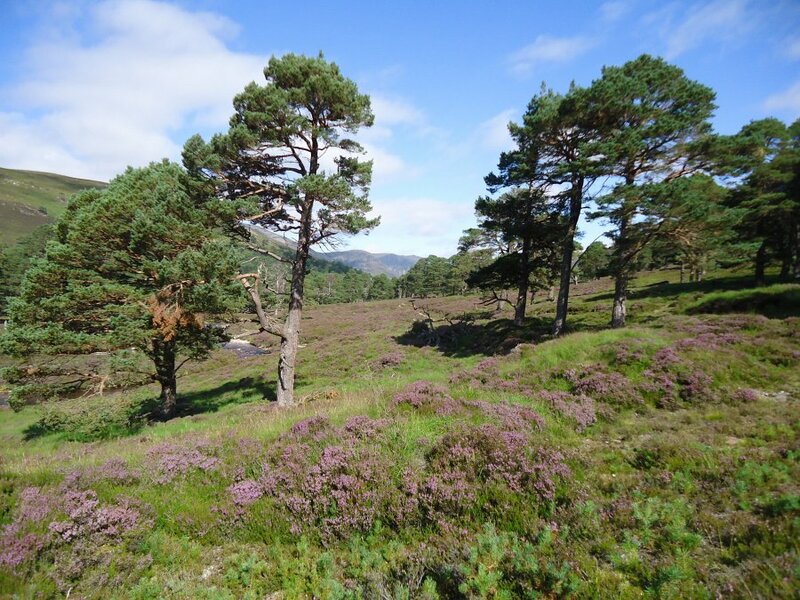 Forecast was for it to get wetter with gale force winds – so Annie, myself and Simon headed Ballater way. 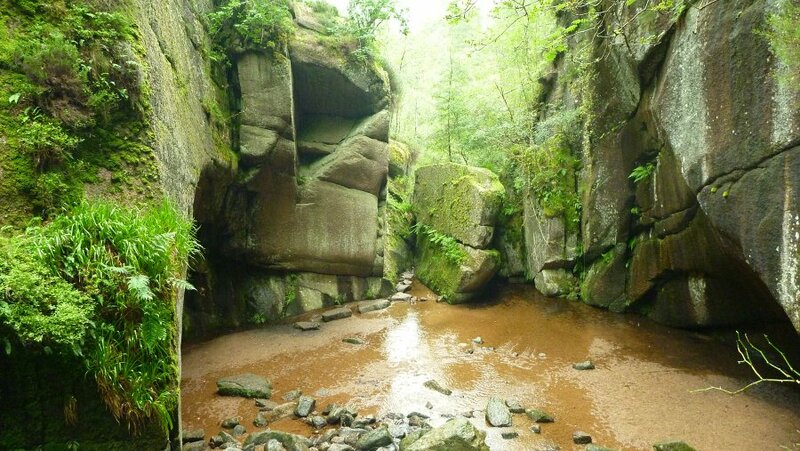 We went for a short walk to 'The Vat', a product of glacial erosion, and followed the river through woodland for a couple of miles before heading back through woods and moorland. The trees were festooned with lichen which was all very pretty. We stopped at a very nice cafe in Ballater for coffee and cake before heading back to the hut for tea and cake. Tuesday morning – sunshine and showers and even more squirrels. Simon had been feeding the birds/squirrels over the weekend. 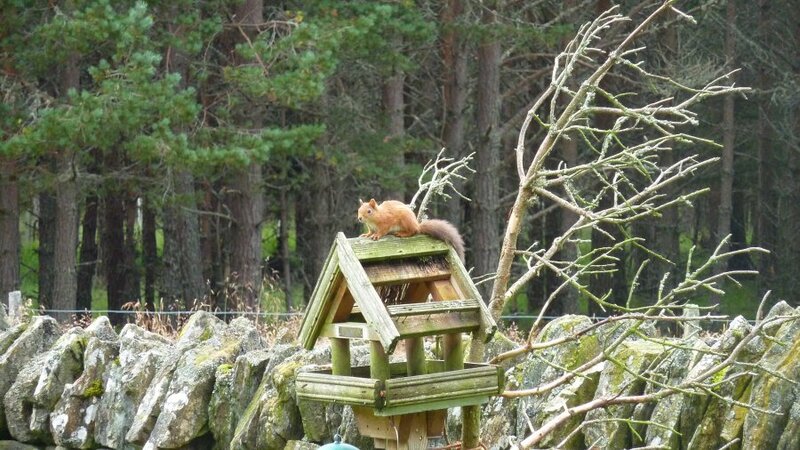 We had only ever spotted 2 red squirrels at the same time but today there were three – chasing each other from the feeder, plus a woodpecker which went on the nuts whilst the squirrels out of the way. Not a bad breakfast view. After tidying the hut – Simon and I headed south to Craig a Barns near Dunkeld. 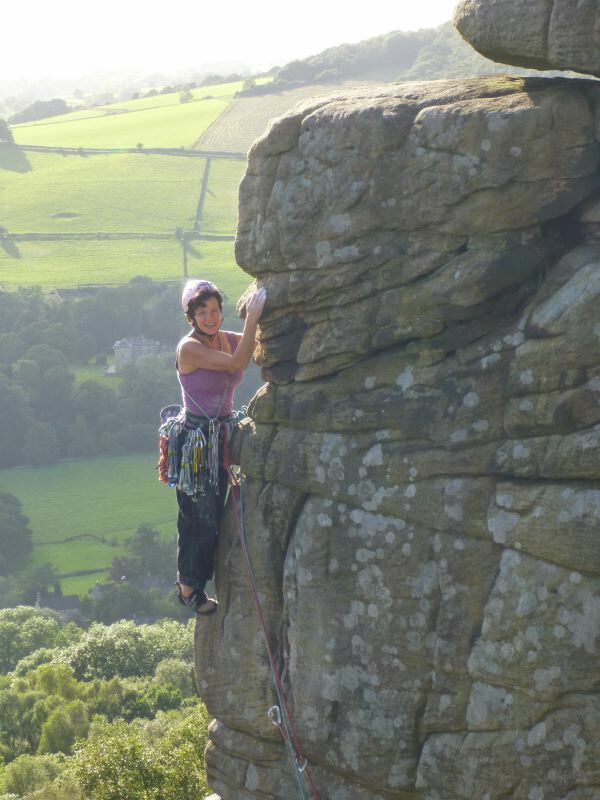 We didn't hold out much hope of climbing given the recent rain and strong cold winds. 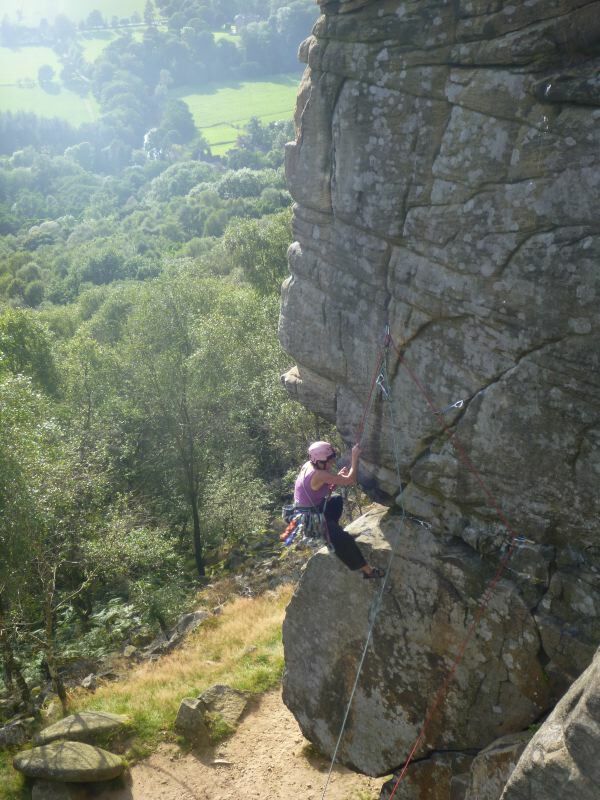 However, we arrived at the crag in the sunshine and sheltered from most of the wind. We were overdressed to start with! 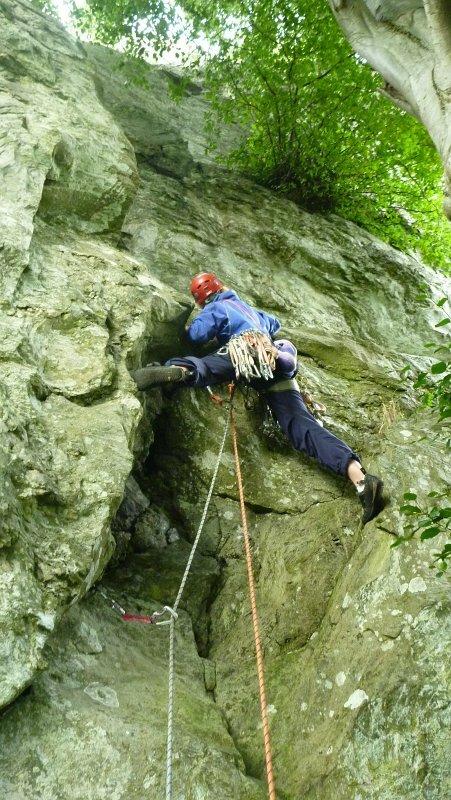 However, it gradually clouded over and winds increased – but we managed to get 2 single pitch routes and a two-pitch route in before the rains arrived. Simon retreated off his last route of the day as the heavens opened. Good little crag for a stop off on the drive back south as just off the A9 and with a 5 min walk in. Some of the routes suffer with drainage more than others – but not bad considering the persistent rain on Monday. Annie was last seen heading south possibly via a friend’s house in Edinburgh. All in all in a good trip to a lovely hut. Certainly wouldn't have wanted to be camping! You are currently browsing the York Alpine Club Blog blog archives for September, 2012.